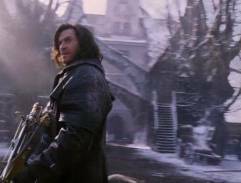 Van Helsing just coming to the village to protect princess Ann against Dracula. 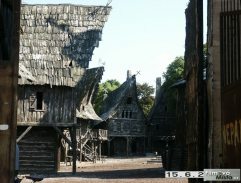 This photo was taken in shooting days, today there aren`t wood buildings. 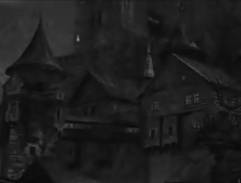 When the sun is goes down, Dracula`s brides are coming and killing villagers. Movie architect has a lot of work here. 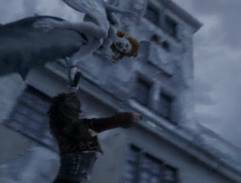 One of the Dracula`s bride takes princess Ann. 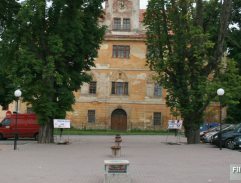 Chateau Kunratice was build in 1688. 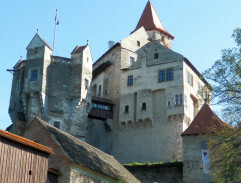 Main building of the chateau is not inaccessible today. 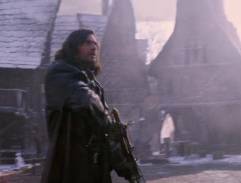 Van Helsing with his helpers are walking through the town and meet one of Dracula's helpers. 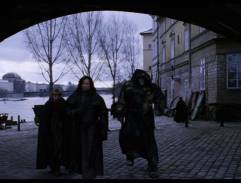 This scene was filmed on the Kampa in Prague. Brigde above is the Charles Bridge (Karluv Most). 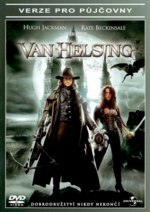 Draculas bride Aleera suggests to Van Helsing a deal. The monster for princess. You can see a Malostranska vez behind Aleera. 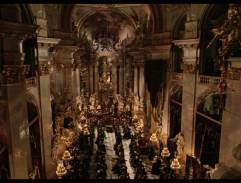 The vampire ball was filmed in the Church of St. Mikulas (Kostel Svateho Mikulase) in Mala Strana in Prague. Real place description: The interior of Church of St. Mikulas in Mala Strana in Prague. 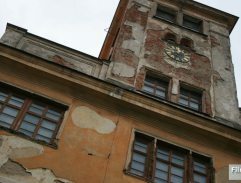 The picture was taken from the ground floor because there is no public acces to the gallery.